Science Fiction Books: Sci-Fi From pulps from the 1940s with classic Science Fiction Art, to First edition Heinleins, you will find a wonderful collection of great sci-fi titles. We have over 3000 in stock with more coming in every day. We carry magazines, hardbacks and paperbacks. We also carry Limited Edition printings by Arkham House. Enjoy great reads like Norton, Heinlein, Clarke and Bradbury, and bring your list for that hard to find title. Sci-Fi From pulps from the 1940s with classic Science Fiction Art, to First edition Heinleins, you will find a wonderful collection of great sci-fi titles. We have over 3000 in stock with more coming in every day. We carry magazines, hardbacks and paperbacks. We also carry Limited Edition printings by Arkham House. 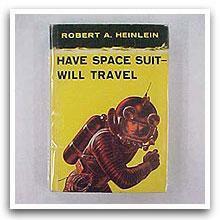 Enjoy great reads like Norton, Heinlein, Clarke and Bradbury, and bring your list for that hard to find title.